Not all books have happy stories, but that does not make them any less beautiful. Some stories stay with you long after they are over, some teach you what you thought you would never learn. This is what Tatiana De Rosnay's book did for me. 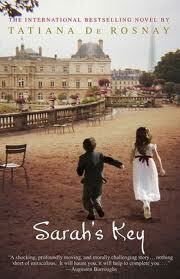 Sarah's Key is one of the most beautiful well written books I have ever had the pleasure of reading. Intertwining two stories with two time periods effortlessly, De Rosnay give us the story of both Sarah and Julia. Sarah is a ten year old living in France during the Holocaust. Telling a part of history so few know, the French involvement with arresting Jewish families. Sarah narrates her family's plight though out this time. Julia is an American journalist who is researching Sarah's history, but soon realizes it is connected with her own life. This is a book that I have been sharing with others since I turned the last page. Not only will I read it again, but I am sure I will be effected by it as much the second time.